An old friend of mine, who used to live here in Muscat some time ago (he left about 6 years ago) happens to be back in the city for a little while for some work, and last night we met up for dinner at Caramel, the new bar and lounge in the Opera Galleria next to the Royal Opera House. I'll probably write a little post about my experience there last night separately, but the cliff notes were: It was really very nice, and I can see why its becoming popular - there's just nothing really on the same level as it here in Muscat. 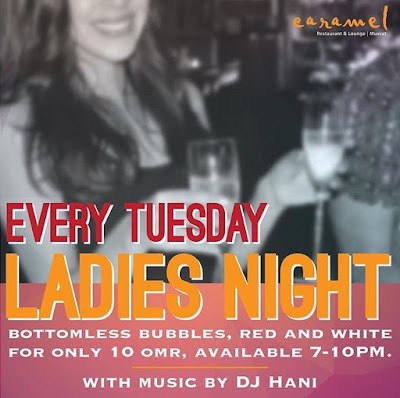 Anyway, every Tuesday as it turns out, is Ladies night at Caramel. Bottomless Bubbles, Red and White wine for a tenner, between 7-10pm. For the guys, I noted that they had Asahi and Heineken on tap, for RO 3 a pint, along with a range of bottled beers too (at a lower cost). So, if you're part of a group of Ladies who Wine(!) or possibly its date night then you might want to check out the situation at Caramel tonight, I'm told it gets quite busy.